Well it only took me 9 months to do it but I broke my brace last week. On what? A crumpet! Of all the foods I never thought would break my brace, my trusty faithful, yummy crumpet was at the top. Well in crumpets defence, it didn't break anything major, it was just my spring. Somehow my spring had come loose and was hanging down in my mouth, and catching my lip and was very annoying because everything I ate got caught. I have a spring over my little baby incisor tooth because it cant handle a bracket, too much pressure and it might fall out. I do wonder if once all this surgery and teeth moving is finished with if they will file down my teeth and get rid of any chips (like the one it that tooth) or ridges so they are all nice and pretty? Or maybe just leave them like are, I don't really know if that is something that happens with this surgery and/or in the UK? I'll add it on to my "Must Ask" list. Anyway, I did manage to hook it back up but I phoned up my hospital to arrange an appointment with my ortho to fix it properly. I went in the next day and my usual ortho Mr O'Neil wasn't available so I saw Mr Bavra instead, he said that my spring had worked its way loose and that it needed fixing. He sort of twisted it back in, but then tied it with some wire on the 2 brackets either end. 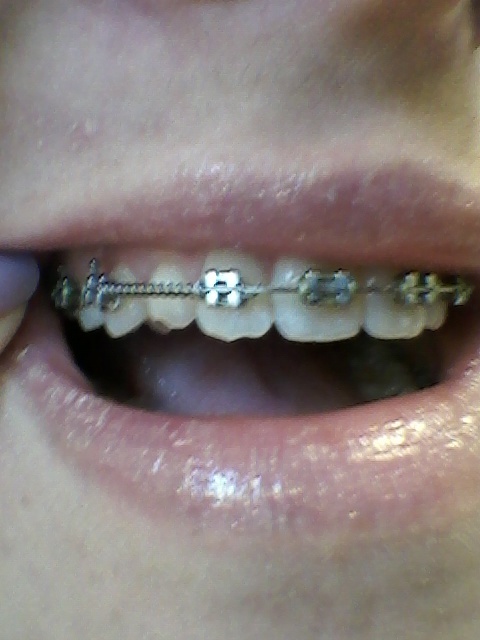 This wire is now putting a bit of pressure on one of my teeth and I really notice it is there. Mr O'Neil has never wired my spring in like this before, so I'm not sure it will stay like this when I go and see him for my next appointment in a couple of weeks, mainly because I will ask him to move it, but hey the spring certainly isn't moving any more!